The Orks are the most widespread of the sentient races, inhabiting worlds across the whole of the known galaxy, and probably throughout whole universe. There are Ork realms, Ork Empires and untold numbers of isolated Ork Worlds. Wherever the humanity may travel in the universe, there are Orks. 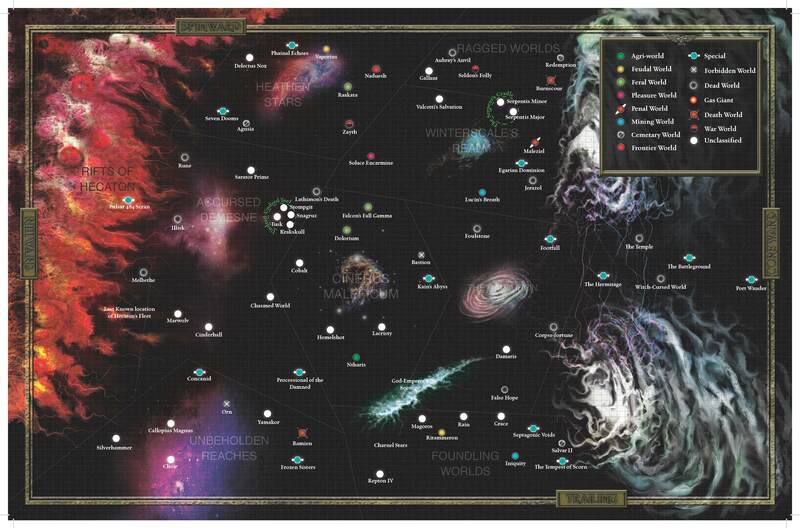 The universe is Orkdom, the domain of Orks and the Eldar say that the Orks have become part of reality itself. Very little is known about the beginning of Ork expansion. It occurs sporadically, giving them an entirely random pattern of settlement through the galaxy. Their main way of expansion is known as Waaagh! — combination of mass-scale migration and holy war through which Orks have managed to get hold on innumerable worlds all over the galaxy. Their expansion is aided by their natural toughness, allowing them to survive in the harshest of conditions and colonise very inhospitable worlds. Particularly successful Waaaghs! capture great swathes of space, resulting in creation of Ork Empires. These are not connected to each other and despite their control over a significant part of known space, Ork Domains are not a united or cohesive organisation - rather they are a collection of thousands of individual territories and empires. These independent factions are as likely to fight with each other as they are with any other species which are sometimes even hard to find in Ork-controlled territories. Due to specifics of Orkoid reproduction, Ork-controlled planets are very hard to recapture and even failed Ork invasions allow them to get hold on the planet. It is widely known that once the world has seen the war with Orks, it is never free from it again as new generations of Feral Orks grow in distant corners to begin new years of bloody conflicts and giving birth to even more Orks. Bork — birthplace of Warboss Klawjaw and the first world of the Empire, conquered during the War for Bhorc Prime, a first battle of Waaagh! Bork. Emiline's Hope — former Shrine World in Yerena System. Glortian Empire. Orks of this Empire fought with World Eaters and Ultramarines during the Great Crusade. Kongajaro — Jungle world near the Empire of Octarius, home to numerous tribes of feral orks. Ullanor — The capital of two powerful Ork empires. This page was last edited on 10 February 2019, at 18:07.